France has seen mixed reaction to a resurgence of Yellow Vest violence that erupted Saturday. Images of protesters proudly posing for photos in front of the vandalised premises of the upmarket Le Fouquet's restaurant and other luxury shops along the Champs-Elysées Avenue have been widely shared on social media. “It's the symbol that was attacked,” said the daily Le Parisian in a story that exclaimed : “Le Fouquet's ravaged by hooligans.” The restaurant, which occupies a prime corner position opposite Louis Vuitton's flagship boutique, is very much viewed as a powerful symbol of France's elite. When former president Nicolas Sarkozy chose it as the venue for his 2007 election victory party (a move he later regretted ), he was blasted for being out of touch with the people. Incumbent President Emmanuel Macron, a former investment banker, has faced similar accusations throughout his time in office. The photograph of one young woman snapped sitting on one of the restaurant's velvet chairs, grinning broadly while reading a menu in front of a backdrop of broken glass, has been shared around on social media - with some hoping to see her identified and shamed, and others congratulating her. 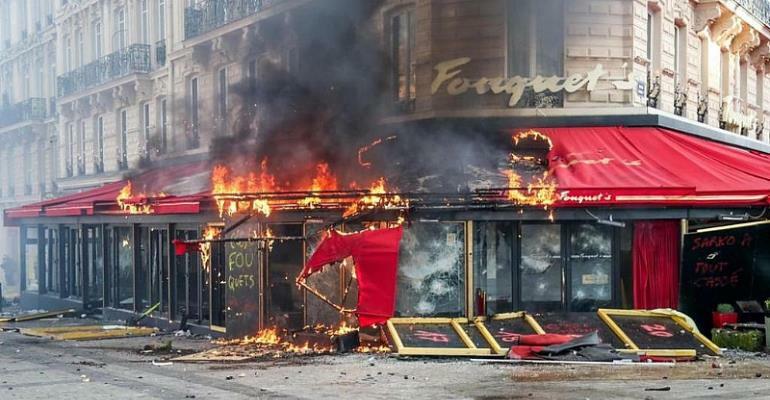 Indeed images of the destruction of Le Fouquet's, which was first ransacked and then set alight on Saturday morning, are the most poignant to come from a day of unrest not seen on this scale since the Yellow Vest movement reached its peak in December. “Back in the day, protesters in France were happy grilling sausages. Now we grill Le Fouquet's,” bemused the satirical journalist Charline Vanhoenacker of France Inter. Another humorist, by the name of Rosa Rosam, chimed in: “To avenge the fire at Le Fouquet's, a horde of wealthy Parisians are on their way to sack the Courtepaille de Pantin ,” she tweeted, referring to a popular budget steakhouse in a less-gentrified suburb north-east of Paris. Overall reactions on social media are divided. Some people condemned the acts of protesters who had “put dozens of Le Fouquet staff out of a job”, while others argued that such a high-end noshery – a favourite of powerbrokers and celebrities – would be reopened within weeks, looking even better than before. “ One in 5 children lives below the poverty line in France , so the violence at Le Fouquet's – where a rack of lamb costs 55 euros – is, quite frankly, affordable,” tweeted one Parisian who described herself as a “womansplainer”. On an official level, Macron, who cut short a weekend ski trip to meet with security officials, said his government needed to make “firm decisions” to ensure that future Yellow Vest violence would be avoided.